The Six Nine Off Suit. 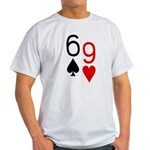 A custom poker shirt from PokerESQ. Some people call this hand “Big Lick” others may call it junk. You can purchase the shirt knowing that is backed by a 100% satisfaction guarantee. Just click on the image on this page to begin browsing.